According to the most recent census, 19 million Americans have some sort of disability. In 1990 the Americans with Disabilities Act was passed making it necessary for public spaces to be handicap accessible. But what about homes? It’s up to you to make your home accessible to all. Perhaps you have a loved one or family member who needs mobility assistance. Maybe you or a loved one are aging and need to make your home suitable for elderly home care. No matter what the reason, making your home handicap accessible will break down barriers and make your home a welcoming place for all. 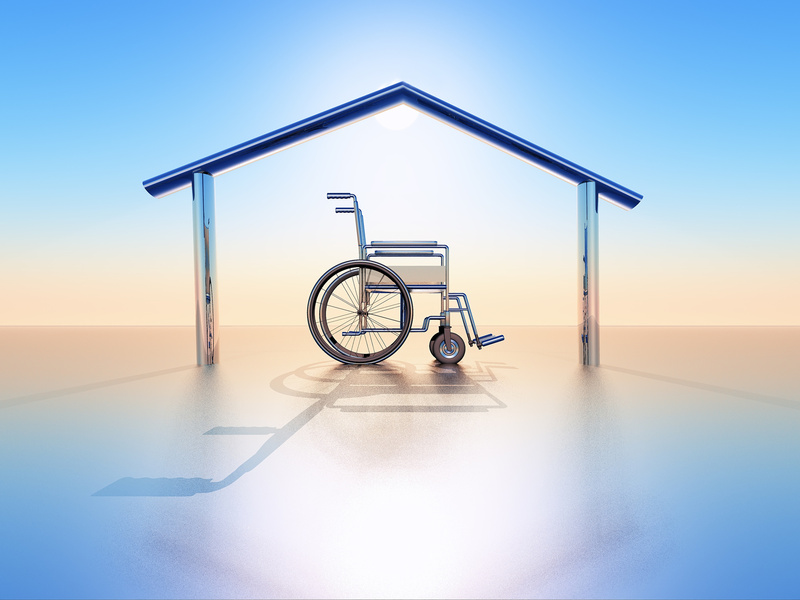 Read on for our tips on making a home handicap accessible. There are several ways to make your home and shared living spaces more accessible to those with mobility limitations. We’ll discuss a few of them here! Almost every home has a front doorstep or porch. And this can be an impossible hurdle for handicap accessibility. But there’s a simple solution. Ramps exist for every type of front door, from steel frames that scale several steps, to simple threshold rams that scale the lip of the front door. Click to learn more about custom ramps. Most doorways aren’t wide enough to accommodate a wheelchair or walker comfortably. You may need to consider the equipment that you or your loved one is using and see if any modifications are necessary. They should be able to access all the shared living spaces (family room, kitchen, etc.) as well as the bathroom and their bedroom. You may need to widen the doorway or use a type of offset hinge that allows for more room. Twisting a round doorknob can be difficult for those who have limited hand movement capabilities. Consider switching round doorknobs for handles that can be pressed down wherever possible. Thick carpet or high-pile rugs can be a hazard for those in wheelchairs. If your budget allows, consider replacing carpet with wood, tile, vinyl or another hard flooring. Hard flooring will make maneuvering around the home much easier. Make sure that you have a sidewalk that leads from the driveway and street to the front door. If you have a back and side yards, make sure that they also have sidewalks. Sidewalks should be in good condition, even, flat, and connected to doors and ramps. Repair any large cracks that could cause tripping to those using walkers, crutches or other mobility assistance. Because so much of what happens in the bathroom is more comfortably done alone, it’s vital that you make adjustments so that anyone who needs handicap accessibility is comfortable. Bars can easily be installed in showers, tubs, next to toilets, and along the wall to give support while bathing and using the restroom. You’ll want to make sure that you choose a diameter of bar that allows the person to grip it around completely. Most experts recommend a 1.5″ diameter for bathroom use. A walk-in shower makes it much easier for those who don’t have a lot of function or muscle in their legs. The alternative of stepping over the edge of the tub can be difficult. You can also install a shower seat to make it easier to be comfortable and safe while showering. A toilet seat riser is a seat that can be placed or installed on top of the toilet to make it easier for someone to sit. The riser makes it so that the person using the toilet doesn’t have to bend very far to sit. This makes it easier for them to get off the toilet seat when they’re finished. Make sure to adjust the water heater so that it never heats water higher than 120 degrees. This will prevent accidental burning while washing hands or showering. Some changes may need to be made to make everyday items more accessible and safe. Lowering the rod in a closet is a simple way to make getting dressed easier. You can also consider replacing tall dresser units with bureau style dressers that are shorter and wider. Most light switches and thermostats are installed at a height considering standing adults. If you are trying to make your home more wheelchair friendly, you may need to adjust the height of the light switch and thermostat in their bedroom and throughout the house. There are many devices and rails that make it easier to get in and out of bed. Another thing to consider is replacing your standard box frame for a shorter one so that the bed isn’t high enough to be dangerous. Make sure if the person uses a wheelchair or walker, that their equipment can comfortably sit next to their bed and be accessible to them without help. Although some of these modifications are simple, many of them won’t come cheap. There are grants available to homeowners who need financial assistance making their homes more handicap accessible. A grant is a monetary gift that does not need to be paid back. Making your home handicap accessible is a labor of love and a demonstration of your acceptance and support of those who need it. No matter your reasons or situation, increasing your home’s handicap accessibility will improve the lives of those you love. Don’t feel pressured to make all these changes at once. Pick a few to start with that make your home more handicap friendly. Visit our health feed today to learn more about all things health related!